Real News Reporter‘s sensationalist headline for its article is “Poor and Broke Camp Out Overnight, Rush the Gates for Gov Rental Assistance”. But are they really “poor and broke”? Drawing on a report, What Is Poverty?, prepared by The Heritage Foundation’s Robert Rector and Rachel Sheffield, Mike Brownfield tells us in his July 18, 2011 article, “What Is Poverty in America?,” that the United States spends more than $1 trillion every year on welfare, but many of the 30 million Americans defined as “poor” and in need of government assistance are very different than the picture painted in movies and on TV. 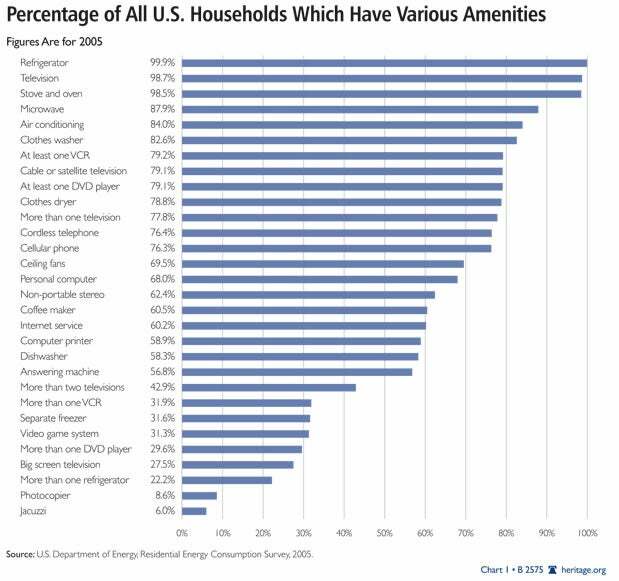 Rather than homeless and on the streets, the average poor American household has luxuries like air conditioning, cable TV, and X-box video game consoles. Lived in a house or apartment equipped with air conditioning and cable TV. The family had a car; a third of the poor have two or more cars. For entertainment, the household had two color televisions, a DVD player, and a VCR. If there were children in the home (especially boys), the family had a game system, such as an Xbox or PlayStation. In the kitchen, the household had a microwave, refrigerator, and an oven and stove. Other household conveniences included a washer and dryer, ceiling fans, a cordless phone, and a coffee maker. The home of the average poor family was in good repair and not overcrowded. 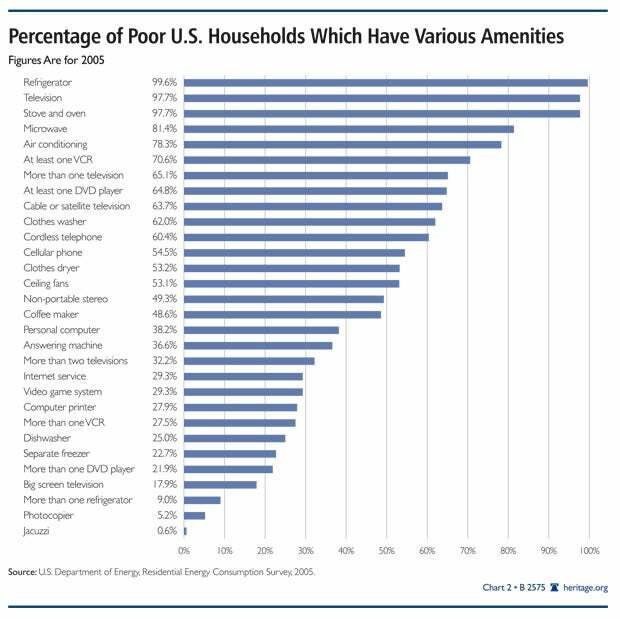 In fact, the typical poor American had more living space than the average, not poor, European. The average American “poor” family was able to obtain medical care when needed. When asked, most poor families stated they had had sufficient funds during the past year to meet all essential needs. By its own report, the family was not hungry. The average intake of protein, vitamins, and minerals by poor children is indistinguishable from children in the upper middle class and, in most cases, is well above recommended norms. Poor boys today at ages 18 and 19 are actually taller and heavier than middle-class boys of similar age in the late 1950s and are a full one inch taller and 10 pounds heavier than American soldiers who fought in World War II. The major dietary problem facing poor Americans is eating too much, not too little; the majority of poor adults, like most Americans, are overweight. To be sure, the average poor family does not represent every poor family, and there are some who are better off and some who are worse off. Though most of the poor are well-housed, at any given point during the recession in 2009, about one in 70 poor persons was homeless, and one in five experienced temporary food shortages. Those individuals have serious concerns. But the fact remains that U.S. government statistics on poverty misrepresent the reality. Now Obama plans to make this situation worse by creating a new “poverty” measure that deliberately severs all connection between “poverty” and actual deprivation. The goal is to measure income “inequality,” not poverty—giving the President public relations ammunition for his “spread-the-wealth” agenda. My husband and I are among the 53% of Americans who still pay income taxes. But we don’t have air conditioning or cable TV or PlayStation. Our cell phones are cheap, prepaid phones. This entry was posted in 2012 Election, Children, Culture War, Economy, Health Care, Liberals/Democrats/Left, Media, Race, Taxes, United States, US Presidents and tagged Heritage Foundation, Obama. Bookmark the permalink. I took a ride around a local section 8 housing development and I did not see one car over two years old. My truck is ten years old. Then I discovered a couple days ago that we not only pay for their home phones we also furnish and pay for their cell phones. Something is really wrong with this picture. I really don’t blame the people as they would have to be stupid not to take advantage of all of these perks. Citizens of the US long ago lost their pride and self respect. Being “poor” here would be an improvement for most of the rest of the world, but left/liberals hype it up here because they love to feel generous (not to mention powerful) redistributing more and more to folk they encourage in this. I understand that this is not ALL the people who are poor, but I sure see enough of them sucking off the system that I & my family can’t afford luxury things. I hear ya on the older cars- that’s all we have too! I scrimp by so they can sit on their lazy butts & collect a check?! A HUGE overhaul with MAKING people ( those who don’t have REAL health issues- not just made up ones) actually still work even if they are receiving SOME assistance.